This important essay dates from the end of the fifties. During this era, the dominant theories of economic growth were based on conditions of private ownership of capital and where investment is primarily under the control of private individuals or firms. Dobbs, however, considers the alternatives. He asks: Do such theories have a more universal application? Can they be applied to planned economies? If they can, in what form may such an application be made? Half a century later, with the global regime of unfettered international capital markets in a state of utter collapse, the time has come for a return to the possibility of rational social and economic planning. This short clear book is again a necessary theoretical starting point for a post-capitalist future. 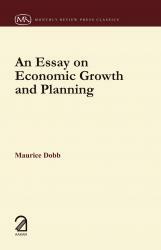 Maurice Dobb (1900-1976), lecturer and Fellow of Trinity College, Cambridge, was the author of the following books, among others: Political Economy and Capitalism (1937); Studies in the Development of Capitalism (1946); Soviet Economic Development Since 1917 (1948); On Economic Theory and Socialism (1955); Capitalism: Yesterday and Today (1958).